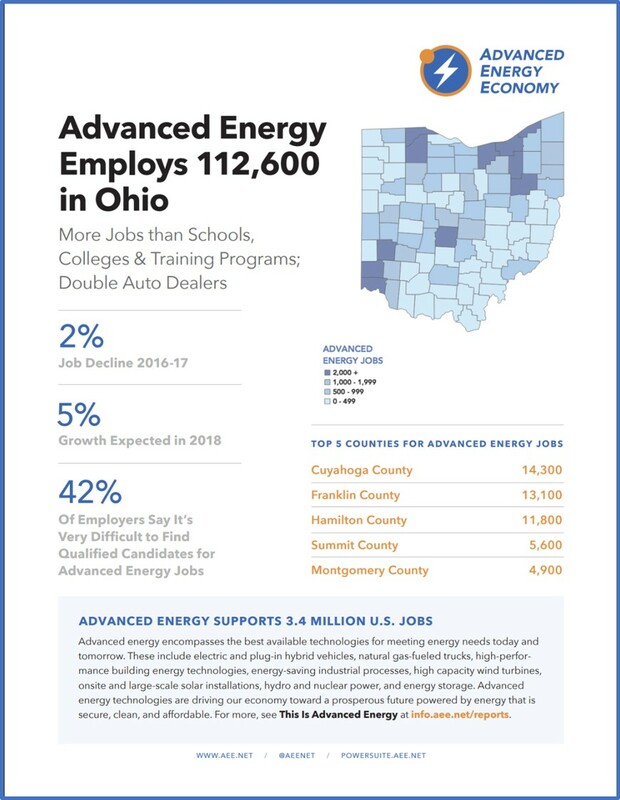 The Ohio Advanced Energy Jobs fact sheet highlights the latest available employment data, anticipated growth, industry comparisons, and top five counties for jobs. These current figures were derived from analysis by AEE and BW Research of data from the 2018 U.S. Energy and Employment Report published by the National Association of State Energy Officials (NASEO) and the Energy Futures Initiative (EFI) earlier this year, as well as data from the Bureau of Labor Statistics. Our energy system is going through a transformational change. Ohio has an opportunity to harness the economic power of the advanced energy industry to transform the state's economy. Please fill out the form to download the Fact Sheet.